Closing out 2018 in style, the December Fireside Magazine brings four short stories, including a few surprises that continue the publication’s tradition of taking chances with form and style and voice. Namely, it has a choose your own adventure-style story that is a complete delight. Online it’s presented as a hypertext piece, with links to the various parts. 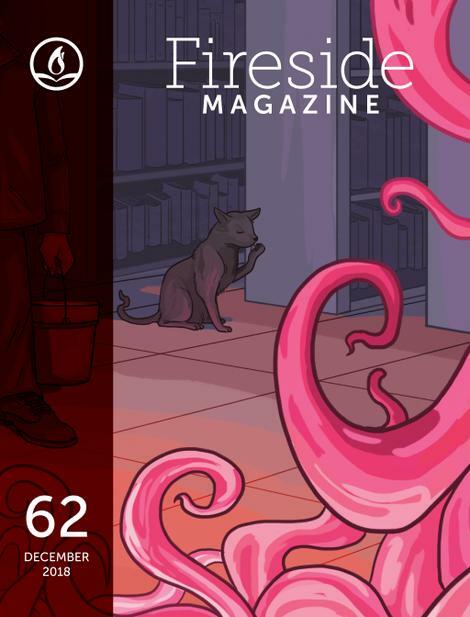 In print, though, as part of Fireside Quarterly, it’s a delightful piece woven through the entire work, a sort of treasure hunt of bureaucratic nightmares. And it shows the dedication to making the print book something to pay special attention to, what with the gorgeous fold out art and continuing dedication to pushing the envelope of what print short SFF can do. But before I gush too much about that, there’s a lot of other work to get to as well, much of it having to do with isolation, relationships, and cats. To the reviews! No Spoilers: Framed as a letter written from one sister to another, this piece builds up a world of princesses and knights and dragons. Where there is a rather interesting setup, where dragons are not exactly the monsters that they are often portrayed as in storybooks. Instead, they are the guardians of princesses, meant to protect them and to prepare a knight who can be worthy of them. The narrator details the process even as she confesses that her own part in the arrangement has changed, and that she’s ready to try something new—an adventure that might open her up to love and ever after or might just be a bit of fun. Either way, the story provides a fun and, yes, charming take on the fairy tales of knights and dragons, recasting the traditional romance to delightful effect. Review: I love the way the story takes these very familiar trappings of knights and dragons and twists them, rearranging them so it’s a sort of game. A game that all sides still take rather seriously (there’s a hint of darkness as the dragons don’t really have a problem with fighting for real when the mood strikes them), but one that carries with a sort of no-hard-feelings dance to it. That they all know the expectations and the rules and they act accordingly. Except that a certain knight has decided to break the rules, and has expressed his interest not in a princess but in a dragon. In the narrator, who doesn’t really know what to think about it. And I love that it’s so unexpected to the narrator, to this dragon who could destroy this knight if she chose and yet finds herself feeling attracted to his persistence and his confidence. How she loves the way he looks at her, when by human standards she’s not supposed to be beautiful. Only for this knight she is, and she lights a fire in him that in turn warms her. And I like that the story isn’t about this love transforming or changing the narrator. Not in a way that makes her different. It’s more about finding acceptance in who she is and revelling in that feeling, that joy. Which is a lot of fun, and really subverts the traditional stories where the knight must slay the dragon and claim the princess. As the narrator herself says, it sets up a situation where the romantic partners can be equals, respecting and enjoying and trusting the other as they go forth on adventures, rather than one person waiting to be rescued by the other. And it’s a lot of fun and an excellent read! No Spoilers: Mr. Bhansal is a janitor at a university library, a job that should be mostly about cleaning up messes in the bathrooms and making sure no one tries to sneak in after hours. His particular situation is a bit complicated, though, by the library having a special collection featuring occult books that can actually open portals to other realms—some filled with some truly nasty creatures. Along with a cat who is not really a cat, he rights a rather secret war against the unknown, all while dealing with the real life realities of budget cuts and reckless students. The piece is fun and funny, building up a world where the occult is only hidden behind a thin veil, but never quite able to break through Mr. Bhansal’s professionalism or positive attitude. Review: This story moves with a slyness that I appreciate, a sort of wink and nod as it follows Mr. Bhansal on his journeys. Because the first thing about him to know is that he’s just a very decent person, trying always to be a professional and good at his job while being courteous and respectful to those around him. Even to the not-exactly-a-cat who is the first indication that for all the mundanity of most of Mr. Bhansal’s world (cleaning, talking to colleagues, university budget worries, stories of watching cooking shows with his dad), there’s something rather different going on as well. Nothing that really cracks the quiet dignity and good-naturedness with which he goes through his day, though. And I just love the way the story kind of pokes at the shows about demon hunters, about the occult—how they paint it as something glorified and gritty when really it’s mostly drunk kids making bad decisions that ushers bad things into the world. And so Mr. Bhansal is there to clean it up. And it’s a fun piece, one that maintains a straight face but definitely conveys the feeling of smiling beneath that. Of really having fun while still keeping the stakes high and the action interesting. Plus extra points for talking cat. It’s a story that I do wish there was a show about, because a janitor guarding a university library sounds like a recipe for a great time. So definitely check this one out! Review: So the story is about applying for disability but I feel that it applies to many kinds of gatekeeping in a bureaucratic sense, where benefits of some sort are held back typically because the good thought behind them is held hostage by the moral objections of those who don’t want “their money” going to something that helps people they’ve decided are “bad.” Here that means making being recognized as disabled basically reserved for those otherwise abled enough to jump through the hoops that are required. From needing to remember many obscure passwords with different requirements to delaying paperwork to requiring notarized documents, the focus is continually on hoping that the applicant will give up. Really, it’s a kind of Catch-22, where the applicant needs to not need the thing they are applying for. If they need it, then the process is designed to leverage that against them, to make them constantly stressed and hurt and erased. For those with time and money and support, it’s easier (perhaps never easy but certainly easier) than for those who need to do it alone, and around the rest of their life. Not to mention that there are waiting times, and fees, and a number of other things to contend with. Doctor in another state? Your state just change their requirements so that it’s different from federal standards? Well, you’re fucked, and no amount of choice is going to help you. Except the one choice that this story really seems to look at—the choice to try until it’s done. To not give up. In the hope that eventually there is help, and a victory of sorts. A fantastic read! No Spoilers: The narrator of this piece wakes to find a cat on her kitchen table. It’s something that seems a bit random, but it brings to the surface all sorts of memories that remind the narrator of where she is as opposed to where she wanted to be. In her life. In her home. The piece is very short but conveys a lot of emotion in that space. A lot of longing. A lot of quiet grief. It’s a piece that looks at the wounds of rejection and the power of acceptance, even when it’s not exactly of the human variety. Review: I love the way this story carefully sets up this final moment of acceptance, of simple joy. And okay, I love cats, so maybe it’s easy for me to really appreciate this, because it sets so much around this very small moment of a cat stretching into a scritch. Because to that moment the story lingers on rejection, on disappointment. The narrator is someone who has faced people leaving them, or stopping short from really embracing them. They have lived through having partners and making plans only for those plans fall through, for their partners to change their minds. Which can be shattering. Which seems to me to make the narrator doubt their own worth, their own future. They seem to feel that no one could like them, or want them, because they’ve been rejected, because the home they hoped to build with someone else is now mostly empty. They are lonely, and this cat reminds them of the ways that they are lonely, and yet at the same time the cat offers them something that they need. Unquestioning acceptance and affection. Which, yeah, cats are assholes but they are also really cute, and often will just accept people they want to pet them. It’s a super cute, rather loaded moment and it’s this instantaneous connection for the narrator, a switch that is flicked between “who is this cat?” and “I have a cat now.” And it’s fun and lovely and a great read!